Are You Ready to RHONE Away From CHARDONNAY??? Sample dialogue between a Sommelier such as myself and a Wine Consumer. Consumer : I Love White Wines. Can You Suggest A Good One” Sommelier : What Types Of Whites Have You Tried And Liked In The Past? Wine Consumer : I Like CHARDONNAY. Sometimes I Like PINOT GRIGIO But Mostly I Love CHARDONNAY! I love a good Chardonnay myself from time to time, especially from Burgundy, France. With that said, there is a Plethora (Too Big Of A Word For This Website…A BOAT LOAD) Of White Grapes that make delicious, Fruity, medium to full bodied White Wines other than Chardonnay! You just have to be BRAVE enough to CUT THE CHARDONNAY UMBILICAL Cord! Are You Ready???? I Will Hold Your Hand Every Step Of The Way. I promise you will Survive! The Map above is of the Rhone Valley Wine Producing Regions in France. When you say RHONE to most people, the first thing that comes to their mind are the Red blends from Cotes Du Rhone and the big boy from Chateauneuf Du Pape. 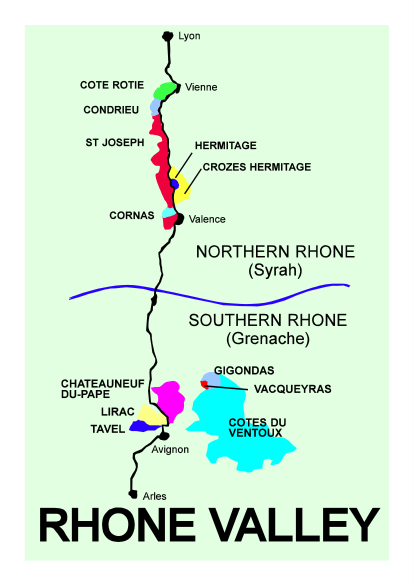 In the Northern Rhone it is all about Syrah or Shriaz Everyone forgets about the delicious WHITE GRAPES that produce fragrant, juicy, refreshing White Wines from that Area such as Viognier (Vee-En, Yay) and the twin sisters of Roussanne and Marsanne and Grenache Blanc and Clairette just to name a few and there are a bunch more. I am a big fan of Viognier as well as blends that contain all three of my favorite RHONE WHITE GRAPES, Viognier, Marsanne and Roussanne. It might be difficult to find that exact blend in France and at an affordable everyday price but once again off to the Pacific Northwest and my Numero Uno Wine Producing Peeps in Washington State. Annette Bergevin and Amber Lane of Bergevin Lane Winery TO THE RESCUE AGAIN! I just tasted this White Wine Above for the the very first time last night. Bergevin Lane calls it Calico White. 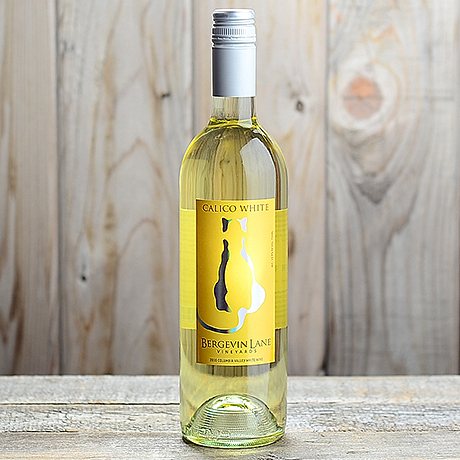 It is a blend of Viognier, Marsanne, Roussanne and a hint of Chardonnay to round it out (Just a Hint) This wine says Summertime Sipper as soon as you take a whiff. I am making this statement to the world on my blog. If Annette Bergevin and Amber can bottle this for my fiancee as a perfume, there is a pretty decent chance this 53 year old man might become a father in the near future!! This has such a pretty nose of Apricots, Citrus, Flowers, Honey, it basically seduces you into wanting to stop sniffing and start tasting. On the palate it has a very nice body with great acidity and a burst of Pears, Nectarine, Mandarin Oranges drizzled with Orange Blossom Honey. It even had that Beeswax creaminess that is typical of these types of wines. I was still tasting the Wine 10 minutes after I took my sip. This is the way to give NEW LIFE to a CHARDONNAY DRINKERS PALATE. The only Negative that would stop me from giving this wine a higher review it had a slight too much HEAT on the finish which is rare for a White Wine with only 13.9% Alcohol. Perfect with salads or all summertime light dishes or perfect to just sit around and hang out in your backyard with. I strongly suggest you Chardonnay Drinkers who drink nothing but Chardonnay take a chance and RHONE AWAY FROM CHARDONNAY and try something different like Viognier, Marsanne, Roussanne Blends like Bergevin Lane Calico White Blend. Don’t Be Too Scared To RHONE AWAY… If you really get homesick, I promise you it won’t be too difficult to find your way back safe and sound to another Chardonnay!!! I think maybe Im coming too early or something. But keep on with the post and I hope that one day you get a tv show or radio show. NextPINOT TRIO! Have It Your Way!